Nothing says Christmas time quite like thousands of colorful lights coordinated to music, and Wichita is home to many outstanding displays. 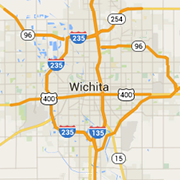 We've updated our list and checked it twice so you can see all of Wichita's Christmas Lights! This light show is one of a kind. Stroll through Field Station: Dinosaurs' Holly Jolly Jurassic Holidays Display and enjoy over 40 life-sized dinosaurs and 50,000 Christmas lights. Hours: 5:30 p.m.-10:30 p.m. on weekdays, until 11 p.m. on Fri.-Sun. Now in its 17th year, the Lights on Texas (formerly the Lights on Lawrence Ct.) show is the biggest residential display in Wichita. The show features 300,000 lights and utilizes four miles of extension cords, 24 breakers, and 100 amps. With a mixture of computer animated lights and traditional displays, the Lights on Texas show is a little different each year. The show offers guests a chance to meet Santa and Mrs. Claus, to walk around and take pictures on the boardwalk and to donate to the Kansas Humane Society. Check out the Lights on Texas Facebook page. “It’s bringing joy to people, and a great way to give back to the community,” said Brad Short who runs the show. Hours: Opens nightly at 5:30 p.m. The Arc’s Lights (formerly Lights on St. Paul) is a 22-year-strong Christmas tradition in Wichita. The drive-through Lights show debuts 100 new displays this year, making the show bigger and brighter than it’s ever been. You’ll also have a chance to meet Santa when you visit, so don’t miss out! The Arc’s Lights is a fundraiser for The Arc of Wichita, which supports children and adults with developmental and intellectual disabilities. In the past, the show has been free with a suggested $10 donation per car. This year, a $10 admission per car will be charged on Friday and Saturday nights only. Sunday through Thursday nights will continue to be free with a suggested donation. Learn more here. Hours: 6-10 p.m. Sun.-Thurs., 6-11 p.m. Fri.-Sat. Four years strong, the Lights on 9th Street show highlights hit Christmas songs. Tune your radio to 101.7FM. The show will run from Thanksgiving to New Years, from 6 to 10 p.m. on Sundays through Thursdays, and from 6 to 11 p.m. on Fridays and Saturdays. The 9th Street Lights show utilizes 25,000 lights and 144 channels. Each year, something different is added. Click here for more. "I think that light shows like mine give the community a way to unwind and forget the stresses of the holiday season. What's better than a thermos of hot chocolate and a bag of cookies and watching a show with your family or friends?" said Jeff McVicker of the Lights on 9th Street. Location: 1002-1037 Cedar Downs Cir. Located in Northwest Wichita's Deer Glen addition near 119th and Central, Candy Cane Lane is truly a sight to see. The cul-de-sac features 20 houses, and each one is decked out for the holidays. If you're a west-sider, this is a great display to visit. Each house has its own decorations, light, and candy canes! Brighten your night with a trip to Wichita's own Candy Cane Lane. Learn More. Christmas at the McKinney’s is one of Wichita’s best-known residential Christmas lights displays. Featuring 150,000 lights what are well-balanced throughout the yard, this show offers an impressive level of attention to detail. Featuring a whopping 10 songs per set and a total of about 40 interchangeable songs programmed, this show offers a lot of variety. Now in its 10th year, this show has continued to grow and evolve each season. Christmas at the McKinney’s is a fundraiser for both the Humane Society and Interfaith Ministries. Learn more here. “we love making Christmas special for us and everyone that comes by. I believe the show brings people around the city together. Sharing such a special time such as Christmas can't be measured in time or money,” said Steve McKinney who coordinates the show. Hours: 6-10 p.m. Sun.-Thurs., 6 p.m.-midnight Fri.-Sat. The Lights on Gold have been lighting up the south side of Wichita for seven years. In that amount of time, the show has grown both in size and in the number of songs. By switching to LED lights, the show runs on less electricity and is more weatherproof, so it can continue to run in the rain. Featuring 13,000 lights, the show is a great option for Wichita’s south-siders! Learn more. “I enjoyed looking at other people's Christmas light displays when I was a kid, and hope others can enjoy ours. We've heard stories of people bringing their kids to see our multiple times a year, and we're glad people enjoy our work,” said show coordinator Matt Robertson. Location: 620 N. Stratford Ln. Features: Classical, Christmas songs. Donations for Lord's Diner and St. Anthony Family Shelter. Special Note: It's been requested that cars avoid blocking the neighbor's driveways, do not turn up your stereo with the windows down, and party buses and limos are prohibited due to engine noise. The Marshal Family Christmas light show has been running since 2007. The show features classic Christmas songs rather than Christmas pop songs and highlights a large nativity as the centerpiece. The show uses nearly 200,000 lights and each one is specifically coordinated to the music! The Marshall family Christmas Lights show will run longer than most shows, concluding on Jan. 6. The show typically features 3-5 songs. Donations will be accepted for the Lord's Diner and St. Anthony Family Shelter in Wichita. The family adds something new to the show each year, so come check it out! For more details, click here. According to the Marshalls, there's a bigger reason than a good show behind what they do. "We feel it is an important way to spread the love of Christ and to remind people what Christmas is all about. A relapse from the distraction of shopping, and crazy times usually associated with this time of year." Illuminations has been making the Christmas season merry and bright for more than two decades! This year, the show will run from Nov. 25 through December 31. The gardens will light up at 5:30 p.m. and guests are invited to come and walk through the winter wonderland until 8:30 p.m. The event will take place seven days a week with the exception of Christmas eve and Christmas Day. Tickets are available online, at Botanica and at area QuikTrips. The biggest fundraiser of the year, Illuminations helps Botanica maintain programs, exhibits and activities. This year, guests will be able to see Santa every night, enjoy snack stations with s'mores and hot chocolate, and have dinner in a new pavilion. "Botanica is pleased to support the community and share the excitement of the season," said Craig Davis of Botanica. The North Pole Substation began 15 years ago and has continued to grow each year since. Its purpose is simple: to bring the reason of the season to children of all ages through Santa and his friends. Part of C.L.A.U.S. ("Christ Living Among Us" - Santa") Inc., the North Pole Substation is a direct result of the passion its founders have for Christmas. Donations are welcome but never requested. Learn more here. Now in it's 7th year this show features over 80,000 lights all set to music and a Santas workshop where you can see Santa and his elves getting ready for Christmas. Tune your radio to 100.7 to enjoy the show's music. Image via Lights on Longview Facebook. Tune your car radio 105.7 FM to enjoy this holiday light spectacular. Over 50,000 lights light up this east Wichita home every night to the end of the year. Their lights are set to an assortment of your favorite Christmas tune remixes.